Hedgehogs are, by nature, nocturnal, but that does not necessarily mean that they should not be awakened for bonding or playtime during the day. Some hedgehog owners have found that their hedgehogs have a particular time when they wake up in a better mood than other times. One hedgehog owner described how her hedgehog was grouchy when woken up at 10 AM, fine at 11 AM, but grouchy when awakened at noon. An hour difference in playtime routine made a big difference for her hedgehog. Even hedgehogs might like schedules! You might need to handle your hedgehog at different times of the day to determine if your hedgehog has a handling time preference. Handling times might also be affected by feeding times. For instance, if your hedgehog is regularly fed at 7 PM it might not want to play at 6:30 PM, when it is anticipating dinner. Some hedgehog owners have spent quite a long time waiting on their hedgehog to wake up on their own, so as not to disturb their sleep. Unless you are waiting in the dark you might be waiting to no avail for your hedgehog to wake. Being nocturnal, hedgehogs are not necessarily on a time schedule depending on the hour of the day, but rather the amount of light at that particular hour. To encourage your hedgehog to come out on their own you might turn the lights off other than a red light, a computer monitor, or a television monitor. Sometimes hedgehogs simply have a case of “bed head” when they first wake up. The hedgehogs simply need to wake up gradually, rather than have a lot of stimulation when they first wake up. It is our natural instinct to want to cuddle and pet our hedgehog when we first wake them up. We want to hold them close and pet them in an attempt to comfort them. However, this is way too much stimulation in the “morning”. We have found the best way to wake up your hedgehog is to scoop it up with firm and deliberate movements (refer to the “Picking Up Your Hedgehog” article) and hold it out in flat hands in front of you. As your hedgehog is allowed to slowly wake up and figure out what in the world is waking it from its slumber, it will uncurl and put its feet down on your flat hands. As your hedgehog relaxes it will start to sniff the air and begin to look around. 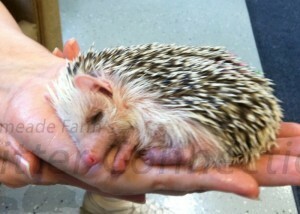 The more comfortable your hedgehog feels the more it will start moving around on your hands and laying its spines down. Many people find that talking to their hedgehog also helps it relax and become comfortable being handled. We suggest NOT petting your hedgehog until it feels comfortable and relaxed. Most people or animals do not want to be touched if they are scared and feel threatened. Unwanted touch does not help a hedgehog relax, but instead might prevent it from relaxing sooner. For more information about petting check out the “Petting Your Hedgehog” article.